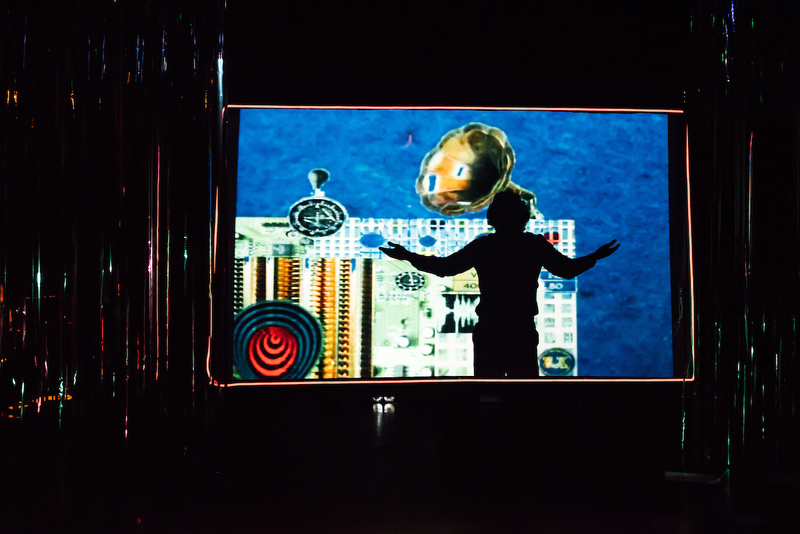 A high-octane mash-up of Mozart opera, electronic sound and video projection, Mozart vs Machine (created by Dominic Robertson) puts the Mahogany Opera Group, under the artistic direction of Frederic Wake-Walker, a visionary, challenging and unfussy director, centre stage of creative thinking. The company is currently touring the work and we caught it on 17 September 2017 at the Jubilee Hall, Aldeburgh, Suffolk. Developed through Mahogany’s Various Stages programme, Mozart vs Machine received generous support from Sound and Music, the national charity for new music in the UK whose mission is to maximise the opportunities for people to create and enjoy new music, while Arts Council England and PRS for Music Foundation helped greatly, too. Collectively, all of these financial contributions have helped tremendously towards the cost in bringing to the stage a totally-absorbing and totally-original work - but a totally mind-boggling one, too - that fitted perfectly the stage and ambience of Aldeburgh’s warm and intimate Jubilee Hall which, by the way, hosted the world premières of Britten’s A Midsummer Night’s Dream, Walton’s The Bear and Harrison Birtwistle’s Punch and Judy. Wake-Walker and Mahogany are no strangers to Jubilee Hall either and triumphed here with Russian Tales (set to a score by Stravinsky/Walton) and Folie à Deux, a collaboration between British composer Emily Hall and Icelandic writer Sjón which brought classical, electronic and folk sounds together in a mesmerising and effective show. 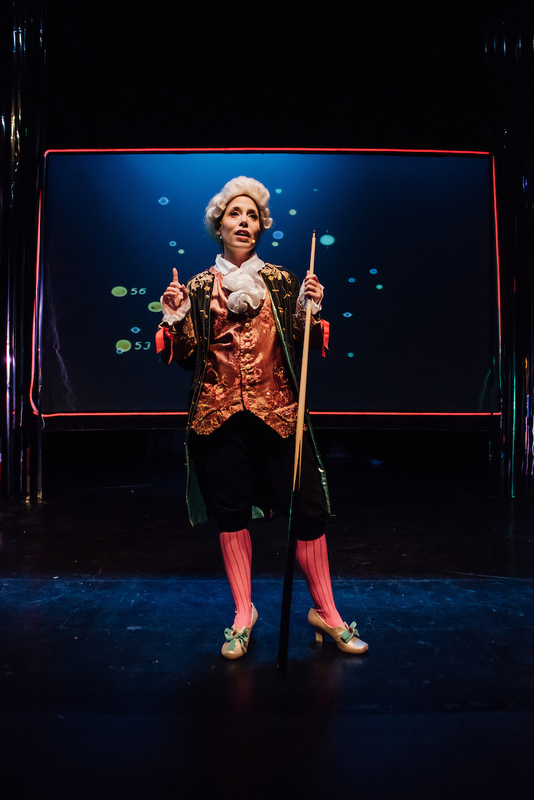 Now Mozart vs Machine - whose scenario focuses on the 20th-century American electronic-instrument inventor/composer, Raymond Scott and the 18th-century classical composer, Wolfgang Amadeus Mozart - is added to the growing list. Currently, the trustees of Jubilee Hall hold exciting plans to bring the venue into the 21st century without losing its historical patina and Mozart vs Machine is the first time that they have promoted an event of this kind for a considerable number of years which was presented in association with the HighTide Festival celebrating this year its eleventh edition. Although presented and produced by an opera group, Mozart vs Machine is so far removed from the genre of opera. A ‘musical installation’ more like it but described by Wake-Walker as an ‘electronic essay collage opera’. That’s ok by me! The brainchild of composer Dominic Robertson (formerly known as Ergo Phizmiz) he has created first hand a surrealist work which combines live and pre-recorded music, shadow puppetry and video images whilst gathering together some of history’s most iconic artists highlighting them within a theatrical sci-fi-game-show while forging together ideas and notes from across history into an irreverent collage of music, theatre or whatever, blurring the boundaries of opera and performance art. Only one musician appeared on stage, the musical director, Katherine Tinker, gracefully attired in 18th-century dress playing harpsichord. 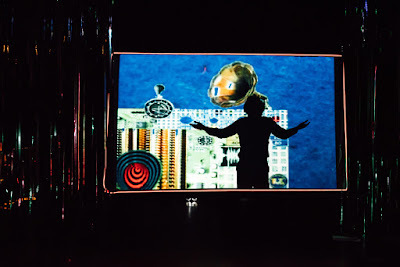 Within his creative framework, Robertson has cleverly incorporated - with a little help from French illusionist and film pioneer Georges Méliès and Lewis Carroll’s Logic Game not forgetting composers John Cage and J S Bach - digital reconstructions which found space with scissors-and-glue edits and inversions of Mozart scores while music-box transcriptions were reversed and flipped and in doing so melodies and progressions are quoted and transformed along the way. Central to the work is the question of how vital the march of technology is to the transformation of music. What happens, for instance, when someone like Mozart, a composer of paper and ink, is placed in theoretical space with a person such as Scott, an inventor of chance-generated loop machines? That’s a big issue, a big question, in fact, that has been floating about, I should imagine, in Robertson’s lively and inventive mind for donkey’s years and has now manifested itself in Mozart vs Machine. Robertson harbours the view that 21st-century opera is any drama of events where the narrative is developed through the dynamic combinations of music and the human voice. Whether this voice is singing or speaking in conjunction with the music is purely immaterial. A musical iconoclast like no other, Robertson rips up scores at will, chops them up bar by bar and reassembles them in his own inimitable style and fashion. For example, one of the most famous arias by Mozart, the Queen of the Night’s big coloratura number from The Magic Flute, received the Robertson treatment and came over in a lyrical, flamboyant and pleasing way. Mozart vs Machine, however, is a work you have to come to fresh and without any preconceived opinion. Some things you got, some you didn’t. It was that kind of work but, nonetheless, very satisfying. But, I’m afraid, not everyone in the audience would subscribe to that sentiment. As I shuffled out of the hall heading towards Crag Path I overheard a female member of the audience asking what it was all about while a male member commented that a plate of fish and chips would have been better. Even better with salt and vinegar! The casting was spot on and three performers portrayed six characters with the character of Raymond Scott played by Bryan Benner who also took on the role of John Cage, the American avant-garde composer and electro-acoustic music maverick. We caught a glimpse of Robertson, too. 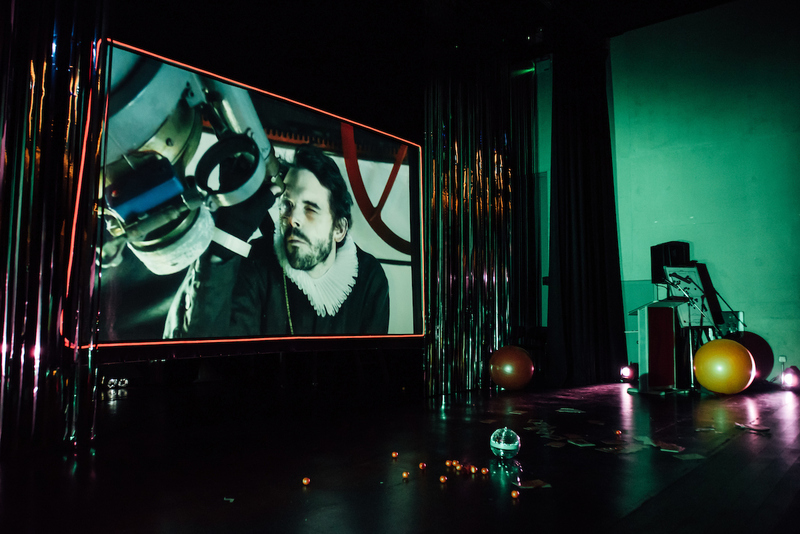 He briefly appeared on screen at the beginning of the piece as Johannes Kepler, the German mathematician, astronomer and astrologer and a key figure in 17th-century scientific revolution. He was explaining his theories of the universe against a colossal telescope clad in a ruff collar sporting a monocle and portraying an image that seemed a near-perfect fit to Sir Patrick Moore, the eccentric and former presenter of the Sky at Night. Like Moore, with his unkempt hair-style, he looked the epitome of the school science-master, speaking slowly and clearly with a touch of nervous excitement in his voice. Working alone in his Manhattan research laboratory Scott is seen trying to develop a machine to generate random musical patterns. But like so many scientific experiments things went wrong and, in this case, one of his devices accidentally rips a hole in the universe and in the process distorts time bringing him face to face with none other than Wolfgang Amadeus Mozart. The sci-fi novel by H G Wells, The Time Machine, flashed through my mind. And from this point in time, Mozart vs Machine - using a rather loose narrative contained within a musical cabaret-type framework - kicks off and the work quickly gathers apace with members of the audience finding themselves on a fantastical journey through the ideas of art and ownership while time and music is shaken up through unexpected directions and random chance. 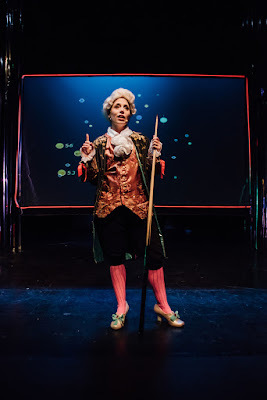 All of this zany action forges a surreal, vaudevillian and hyped-up show trial that puts Mozart - brilliantly sung and acted by the English-born soprano, Rebecca Bottone, whose dress and make-up depicted the wunderkind from Salzburg so vividly - firmly in the dock. But before Mozart gets to the witness-box one sees him being charged by The Referee, played menacingly by Julien Van Mellaerts, who also doubled as J S Bach. Incidentally, earlier this year, Van Mellaerts took First Prize in the 62nd Kathleen Ferrier Competition held at London’s Wigmore Hall. Dressed in gangster-style clothing sporting a black Trilby with a revolver at the ready The Referee’s seen pinning an obstinate-looking Mozart to a bottom-of-the-range family car. The scene echoed Hollywood B movie style action. His charge: a common criminal stealing music for his betterment from an unlikely bunch of modern-day composers including such names as Charlie Parker, Little Richard and Winifred Atwell - even The Beatles. Stravinsky was in there somewhere. Beethoven - maybe? The show's title equated closely to the conversation that Raymond Scott had with Wolfgang Amadeus Mozart who argued from the point of view that human-beings created music in the best possible way while Scott insisted that machines can go one better. Therefore, to generate music, Scott experimented with sounds that were seemingly random. 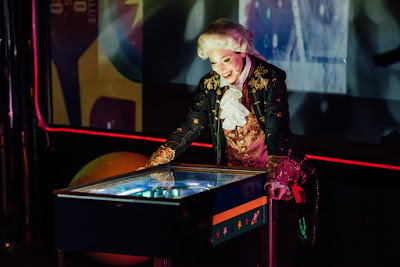 Mozart, too, was not without his external influences either which included the clicking sounds made by billiard-balls at play (Mozart was a keen player, I found out) which often inspired him in his writing. Basically, both composers were reading from the same page and their cumulative ideas gave way to John Cage. Therefore, towards the end of Mozart vs Machine, we encounter Cage’s famous three-movement composition, ‘Four thirty-three’, composed in 1952 for any instrument or combination of instruments, but the score instructs the performer(s) not to play their instrument(s) during the entire duration of the piece. It was a moment to relish and it reminded me of the London International Surrealist Exhibition in 1936 when Salvador Dalí, then in the prime of his artistic career, gave a lecture wearing an old-fashioned deep-sea diving-suit representing how he existed at the bottom of the sea of subconciousness. Nobody heard a word, of course, but the ‘happening’ has gone down in history as a challenging piece of Surrealist art. Silence is golden in more ways than one! And to stamp his authority and to crown his quirky work, Bryan Benner silently appeared on stage as John Cage wearing a T-shirt aptly inscribed: SHUT UP - I’M JOHN CAGE. J S Bach had his moment, too, inasmuch as during the rendition of ‘O sacred Head, sore wounded’ from St Matthew Passion, a television test card was punctuated by 1685-1750 BACH. Where was the merchandise? Supporting the principal cast was a 13-piece chorus made up by the best of local singers. They acted as The Jury and were involved in four numbers ‘Entry of the Jury’, ‘Judges’ Blessing’, ‘Judges’ Song’ and ‘The Melomaniac’ while they also spent a large proportion of their time bouncing on retro space hoppers - hopefully to the beat! Wake-Walker, assisted by Peter Cant, has ingenuity and foresight in his approach to the work he engages in with Mahogany Opera and always gathers round him creative teams of exceptional quality. Those working with him on Mozart vs Machine delivered the goods in a positive and forthright manner and comprised Kitty Callister (designer), Ed Borgnis (technical designer and production manager), Claire Childs (original lighting design), Neill Brinkworth (re-mount lighting design), and Simon Mathewson (animation) while Jasmin Hay acted as stage manager and Emily Howard, wardrobe manager. Historical note: Raymond Scott, by the way, was an American composer born Harry Warnow in 1908. A band-leader, pianist, engineer and recording maverick he enjoyed a long and fruitful life departing this world in 1994 aged 85. Scott was a wizard, too, in the field of hi-tech and his work as an electronic-instrument inventor earned him the title ‘the father of electronic music’. In fact, millions upon millions of cinemagoers have probably encountered his work but don’t recognise his name. It was fellow American composer, Carl Stalling, who brought his music to public attention by adapting it in over dozens of animated films such as Bugs Bunny, Porky Pig, Daffy Duck and Looney Tunes.